Science reveals to us an abundance of reasons that stretching is beneficial for senior citizens’ health. Study after study demonstrates that stretching helps to improve well-being and prevent chronic diseases and conditions. This is of vital importance here in Australia. Our Department of Health tells us that chronic conditions are the primary cause of death and disability for Australians, accounting for 90 per cent of all deaths in Australia. Our government has also determined that most chronic conditions are preventable. Stretching alone cannot typically prevent chronic conditions; it’s also important to do cardiovascular exercise, consume nutritious foods, refrain from smoking and refrain from abusing alcohol. These things, together with stretching, are some of the most important preventative measures senior citizens can take to protect themselves from chronic disease. Healthy arteries are not stiff. They maintain elasticity despite aging. Unfortunately, many senior citizens experience stiffening arteries as they age. Stretching is one possible means of combating the problem with stiffening arteries. Researchers have found that trunk flexibility is correlated with less stiffness in the arteries. Adults over the age of 40 who are able to sit on the floor with legs extended and touch their toes are far less likely to suffer from stiffening arteries than those who cannot touch their toes. This discovery is of crucial importance, because stiffening arteries are a risk factor for far worse problems such as cardiovascular disease. Subjects in multiple scientific studies have reported a decrease in various sorts of aches and pains after having implemented a stretching routine, or an exercise programme that includes ample amounts of stretching. Stretching the back, abdominal muscles, thighs and buttocks can be particularly helpful for managing lower back pain. Stretches can also be effective for managing pain in the shoulders, knees, neck or other body parts. Researchers have determined that stretching can positively influence many different aspects of an elderly person’s gait. Many people over 60 find that stretching can help to enable longer, smoother and faster strides when walking. This is because stretching can affect the tilt of the pelvis and positively influence the range of motion in the hips and pelvis. Stretching enables supple, flexible muscles that might assist your body with resisting injury. In contrast, stiff and inflexible muscles and connective tissues can hinder your mobility by restricting your joints from passing through their normal range of motion. Expert opinion diverges on whether improved flexibility can help to prevent injuries. Some believe that stiffness can make you more prone to sprains and other injuries, while flexibility reduces the likelihood of injury. On the other hand, strains caused by overstretching are common. So always be mindful of that possibility, and don’t overdo it when you stretch. Researchers have demonstrated that stretching the lower extremities results in improved balance in adults ages 58 and over. They concluded that these significant improvements in balance have also resulted in fewer falls. If you’d like to try this for yourself, you’re likely to find that it only takes 10 weeks of consistent stretching exercise to achieve dramatic improvements in your balance. Stretching can also positively influence posture. If you have a tendency to slouch, try stretching your back and shoulders. Stretching can help to counteract that tendency and re-acquaint you with your correct posture. Do you have a hard time tying your shoes? Do you ever find it challenging to lift and carry bags of groceries by yourself? Is it getting harder and harder to climb up stairs, bend over or retrieve objects you’ve accidentally dropped on the ground? Stretching can help you overcome these obstacles. These are the a few of the sorts of things that can help to determine whether you’re able to continue living independently, or whether you may soon need nursing care. Of course, these are not the only issues that determine whether nursing care will be needed – but they are a crucially important component of that overall determination. Stretching can feel really good. It can help to relax tense muscles. If you sit in the same place for extended periods of time, stretching can help to counteract any negative effects you’ll experience from that. Seniors who start on a stretching programme often report enhanced feelings of well-being because of it. You’ll want to start incorporating daily stretches into your routine in the future if you aren’t already enjoying the benefits stretching can have. However, we urge you to take care in getting started. While it is important to implement a stretching programme as soon as you can, it is also crucial that you avoid injury from starting off too aggressively. You’ll want to start off with just a small number of stretches and increase your activity levels slowly over time. We also recommend that you avoid bouncy movements while stretching. There are instances where bouncing can be problematic. 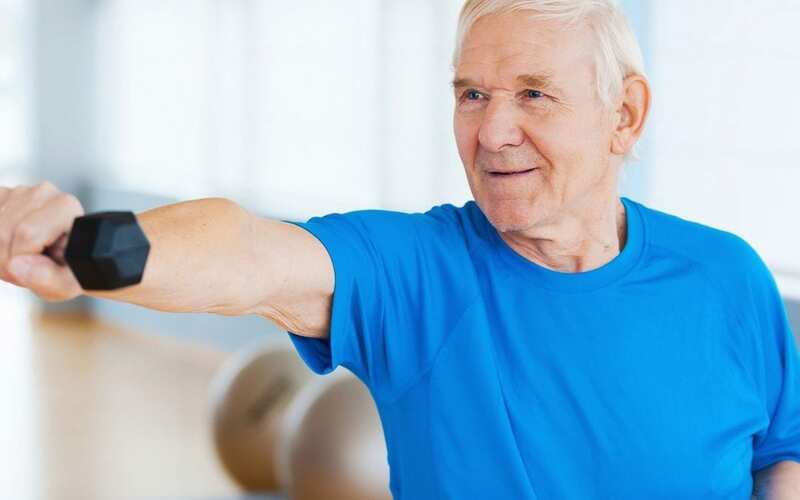 If you’re over the age of 60, and you’ve led a sedentary lifestyle in the recent past, it is advisable to seek assistance with your exercise programme from a qualified professional. We’d be happy to help. Exercise is a specialty of the physiotherapists and exercise physiologists on our team. We work with many elite athletes; however, be assured that you do not have to be a star performer to get star-quality treatment at our facilities. You do not need a referral to schedule an appointment with us, although getting a referral from your GP may be helpful in certain circumstances. We’re able to accept physio health insurance from many of Australia’s private health insurance providers; this type of cover is typically included under extras cover plans, also known as ancillary cover plans. We’re a HICAPS healthcare provider, which means that you will be able to simply swipe your health fund card on the day of your visit to easily claim any applicable physio health insurance benefits made available to you through your health fund. Get in touch with us if you’d like help with implementing an exercise programme that can help you to prevent disease, feel better and enjoy all the benefits discussed above. We hope to hear from you soon.